Inventory We are a resale marketplace, not a box office or venue. Ticket prices may exceed face value. This site is not owned by The Fillmore Auditorium . The Fillmore Auditorium Denver opened back in 1907 as the Mammoth Roller Skating Rink. After more than 50 years operating mostly in the roller rink capacity the building was purchased by Stuart Green with the intent of making a concert venue. 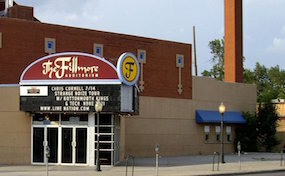 The Fillmore Auditorium box office is located at 1510 Clarkson Street in downtown Denver, CO. One of the largest general admission facilities in the country the current capacity is at 3,700. The last major renovation occurred in 1999 and since then The Fillmore tickets have included performers like the Foo Fighters, Widespread Panic, Morrissey, Paramore and many others. AuditoriumDenver.com is not a primary vendor, supplier, or affiliated with any official website. We are independently owned and operated concentrating on all events in the resale secondary ticket market. Ticket prices may be well below or above face value and will fluctuate with demand. To purchase tickets for all The Fillmore Auditorium Denver events simply click on the show of interest or call our operators at anytime.